The miracle of Chanukah. Also, Mom’s recipe for latkes, which are pretty miraculous all by themselves. Happy Chanukah, to my Jewish and non-Jewish friends alike. Rabbis argue over which is the real meaning of Chanukah; is it the miracle in the rededicated temple, where one small jug of oil burned in the menorah for eight nights? Or does it celebrate the victory of a small, determined group of people over a rich, greedy and powerful nation that wants them to change their ways? It’s both, of course. We eat latkes this time of year to remind us of the miracle of the oil. My Mom’s recipe is the best, and I’m passing it along. You can thank me later. As a side note, I should add that during WWII, they were made with discarded potato peels scavenged from the neighbors’ trash. And my father’s family, hiding in the forest, used wild horseradish. Tin pan lined with paper towels, with more paper towels on hand. Sour cream or applesauce, your choice. Stir in eggs, matzo meal and salt. Pour 1/4 inch of oil into a frying pan. Heat that sucker up. Flame should be high to start. When the oil is very hot–test it by skittering a few drops of water across the surface and seeing if they dance–gently drop in latke batter, using a serving spoon. 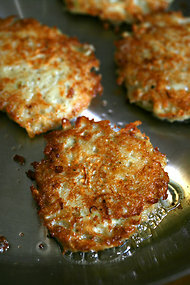 With the back of the spoon, gently pat latke down to a sort of flattish round or oval–but not too thin. Depending on the size of your pan, you should have room for four or five latkes. Try not to crowd them. Turn heat down to medium. Like pancakes, flip when they are golden brown underneath. (Just so you’re not surprised, they’re like little sponges. They soak up a lot of oil, so you’ll have to keep adding.) When they’re ready, slip them into the paper-towel lined tin pan. After you’ve filled up the bottom of the pan, add more paper towels and place additional layers of latkes on top. These may not make it out of the kitchen. Devour immediately. « My story is nominated for a Pushcart Prize!